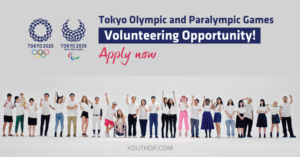 The Tokyo Organising Committee of the Olympic and Paralympic Games (Tokyo 2020) announced today that it will start inviting applications for the Tokyo 2020 Games volunteer programme from 26 September 2018. Volunteers will provide valuable support for the operation of the Games in a variety of roles at competition venues and at the Athletes’ Village, and their contribution will be a key factor in the Games’ success. The exact closing date for applications will be announced on the Tokyo 2020 website at a later date!